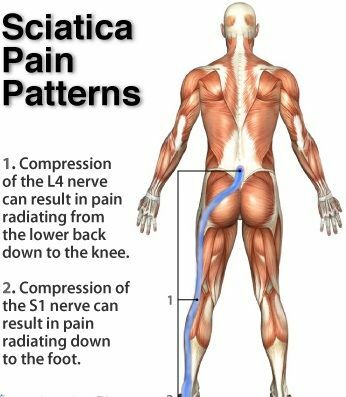 Sciatic nerve pain can be so excruciating and debilitating that you don’t even want to get off the couch. Common causes of sciatica can include a ruptured disk, a narrowing of the spine canal called spinal stenosis, and injury. The sciatic nerve runs down the spine and branches off, like a zipper, down the legs. The pain of pressure on the sciatic can feel like sharp shocks running down your leg (generally just one at a time) or nagging lower back pain. Sometimes people experience numbness or tingling in the leg, too. 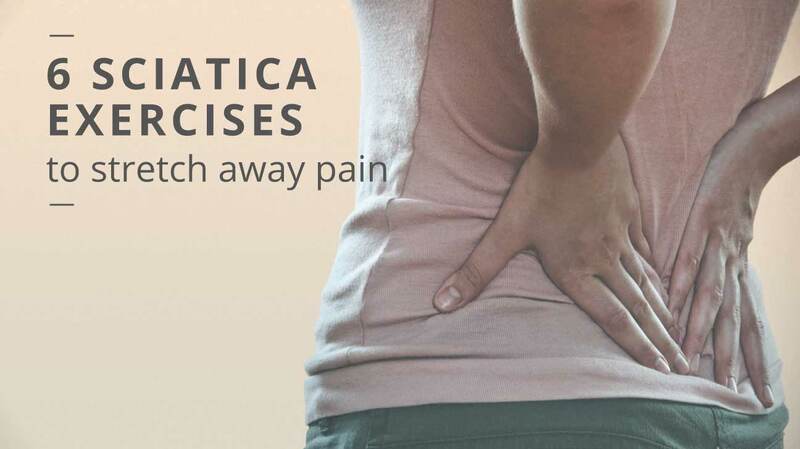 Sciatica pain can occur for a variety of reasons. Identifying ‘what doesn’t move’ is the first step toward solving the problem. Often, the most problematic body parts are the lower back and hips. The best way to alleviate most sciatica pain is to do any stretch that can externally rotate the hip to provide some relief. Here are six exercises that do just that. Pigeon Pose is a common yoga pose. It works to broadly open the hips. There are multiple versions of this stretch. The first is a starting version of the pigeon pose, known as the reclining pigeon pose. If you are just starting your treatment, you should try the reclining pose first. Once you can do the reclining version without pain, work with your physical therapist on the sitting and forward versions. While on the back, bring your right leg up to a right angle and grasp it with both hands behind the thigh, locking your fingers. Take your left leg and place your ankle against the knee. Hold the position for a moment before changing legs. This helps stretch the tiny piriformis muscle, which sometimes becomes inflamed and presses against the sciatic nerve causing pain. Repeat by switching sides and doing the same exercise with the other leg. Sit on the floor with your legs stretched out straight in front of you. Then bend your right leg, putting your right ankle on top of the left knee. Lean forward and allow your upper body to lean toward your thigh. Hold for 15 to 30 seconds and then switch sides. This stretches the glutes and lower back. Pick up your right leg and move it forward so that your lower leg is on the ground, horizontal to the body. Your right foot should be in front of your right knee while your right knee stays to the right. Take a deep breath. While exhaling, lean your upper body forward over your lower leg. Support your weight with your arms as much as possible. Lie on your back with your legs extended outward and your feet flexed upward. Clasp your hands around your knee and gently pull your right leg across your body toward your left shoulder. Hold it there for 30 seconds and then push your knee so your leg returns to its starting position. Repeat for a total of 3 reps, and then switch legs. Remember to only pull your knee as far as it will comfortably go. You should feel a relieving stretch in your muscle, not pain. Sciatica pain is triggered when vertebrae in the spine compress. This stretch helps create space in the spine to relieve pressure from the sciatic nerve. Place your left elbow on the outside of your right knee to help you gently turn your body toward the right. Hold for 30 seconds and repeat three times, then perform this stretch with your left leg bent and body turned to the left side. 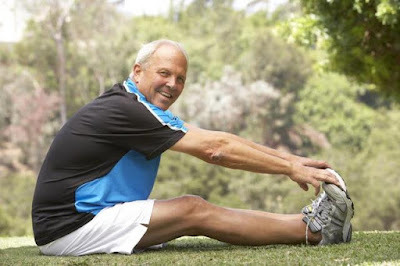 This stretch can help ease pain and tightness in the hamstring caused by sciatica. Place your right foot on an elevated surface at or below your hip level. This could be a chair, ottoman, or step on a staircase. Flex your foot so your toes and leg are straight. If your knee tends to hyperextend, keep a slight bend in it. Bend your body forward slightly toward your foot. The further you go, the deeper the stretch. Do not push so far that you feel pain. Release the hip of your raised leg downward as opposed to it lifting up. If you need help easing your hip down, loop a yoga strap or long exercise band over your right thigh and under your left foot. Hold for at least 30 seconds, and then repeat on the other side. Sciatica is not actually a specific diagnosis, but actually a symptom of another underlying cause. 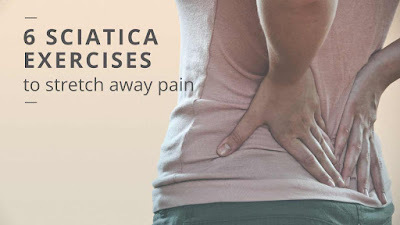 Sciatica refers to the pain that is produced in response to pressure on the sciatic nerve, which runs from your lower back (or lumbar spine) down to your buttocks, hip and lower limb. As mentioned above, sciatica is the pain that is experienced due to an underlying issue. The most common causes of sciatic pain include: herniated lumbar disc, degenerative disc disease, isthmic spondylolisthesis, lumbar spinal stenosis, piriformis syndrome and sacroiliac (SI) joint dysfunction. Essentially, any of these listed diagnoses create pressure against the sciatic nerve. When the nerve is pushed or pinched by another structure, it causes an irritation of the nerve. Because nerves have pathways within them that send messages from your body to your brain and vice versa, your brain will register this irritated sensation as sciatic nerve pain. Other causes of sciatic nerve pain might include things such as pregnancy. With pregnancy, a woman’s body can go through many changes and with the additional weight this can cause pressure to build up against the sciatic nerve. Fractures of the lumbar vertebrae due to traumatic injuries from car accidents or a fall or in response to a weakened bone from osteoporosis can also create issues along the sciatic nerve. In rare cases, a spinal tumor or infection might cause sciatic nerve pain. In some cases, sciatic pain can be temporarily relieved through the use of a hot or cold compress or with common pain medications, such as ibuprofen (Advil) or acetaminophen (Tylenol), those these options will not treat the underlying cause of sciatic pain. Since the cause of sciatic pain can be any number of things, it is best to make an appointment with your physiotherapist for a full assessment to determine the cause itself. You do not need a doctor’s referral to make an appointment with a physiotherapist for sciatic pain in British Columbia. In some cases, you may also need to see a doctor for additional tests, such as diagnostic imaging. In the most severe cases, you may be referred for a surgical consultation. This is generally reserved for those experiencing extreme weakness in the lower limb(s) affected or for those with impaired bladder function due to irritation of the spinal nerves. When you have sciatica, you experience pain radiating from the sciatic nerve. Symptoms of sciatica include pain starting at the buttocks and extending down the back of the legs. To treat sciatica, a doctor may recommend exercises to strengthen the sciatic nerve. If you are pregnant, speak to your doctor about any modifications you need to make before doing the exercises. Here are some steps on how to strengthen the sciatic nerve. Exercise daily. Exercise is better than rest for sciatic nerve pain. If you do not exercise, the muscles weaken and the condition may worsen. After a flare-up, rest for only two days until you start working the area. Stretch the hamstring muscles. Hamstring stretching will help strengthen the sciatic nerve if done on a regular basis. Place your right foot in front of you with the toes pointed upward. Lean forward until you feel a stretch in the back of your legs. Hold for five seconds and switch legs. Do a total of 10 reps for each leg. Perform 20 reps of prone extensions. Prone extensions help strengthen the sciatic nerve and can provide relief for individuals who suffer from sciatica as a result of a herniated disk. Lie in the prone position with your body propped up on your elbows. Press the hips into the floor and stay in place for approximately 10 seconds. Work the back to strengthen the sciatic nerve. Back stretches are types of exercises helpful for sciatic pain from nerve compression. Lie flat on your back and push your belly button into your back. Contract the abs and hold the stretch for 10 seconds. Repeat eight times.